I’ve been reading and attempting to learn from Christi the Coupon Coach with her book Couponing Made Simple as part of the Review Crew. I’ve ‘couponed’ before, but never anything spectacular. I’ve had a hard time finding coupons for things that we’d normally buy – but I recognize that if I bought a different brand for a better price, it would replace what I normally buy and save me money in the long run. I read the book, agreeing with a lot and learning some new things as well. I’d hoped when I got chosen for this review I’d have a spectacular table full of goods and an impressive receipt to photograph to go with it. I don’t. I do, however, have more knowledge than when I started, and, armed with what I’ve learned, I think that I can eventually get there. I didn’t expect to get there overnight… but one could hope! Coupon Christi had many tips, ideas, and suggestions for becoming a successful coupon shopper. She doesn’t make suggestions for specific coupon matching websites since they tend to come and go, but she did suggest what to search for to find what you need. She told how to do matchups on your own as well, but I have found in my own ventures that there is a world out there, free, that will walk you through which coupons and sales to match up at any current time. Couponing takes time. There’s no getting around it. Hiring a babysitter for my brood of six isn’t cost effective to help out the grocery/personal care budget – it would be trading one budget category for the other. For me, it just isn’t an option. A lot of Coupon Christi’s suggestions aren’t quite feasible for what I have to do, and driving around with my big van has to be taken into careful consideration to make it cost effective. Because of these factors, I haven’t been super motivated to get better at this in the past, but after reading Couponing Made Simple, I think that even on a small scale, adding one more stop to our week would still save us plenty once I got better at this. She suggests one paper’s flier per household member, and while that would be fabulous, I haven’t found a cost effective source to pursue this that far. I’ve yet to be successful with the drugstore stop, but I’m encouraged I can eventually be successful. And so, I’ll persist. I can’t see myself ever being able to dedicate the hours per week that would be required to slash my grocery expenditures, unfortunately, but maybe with practice in a small area, I can make this work. All in all, I really appreciated this book. It’s a lot of what I’d read before, some was new, but it was all in one place for me to read, glean, and learn from. Coupon Christi has a great approach – being a good steward of what God’s given her – and provides encouragement and help for the reader from a learned and experienced source. “Couponing” Christi Bassford and her husband Robert have a heart for helping others reach financial success and have created this and several other resources to help others on this journey. 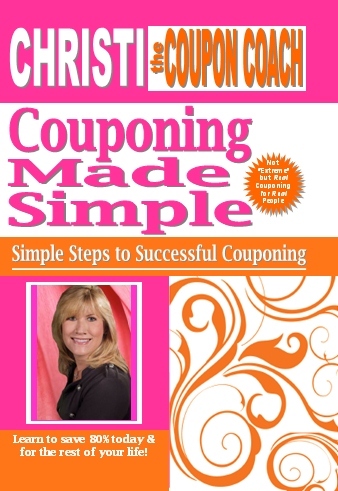 Couponing Made Simple is available here or on Amazon for $18.00. To read others tales of their venture into couponing with Couponing Made Simple, visit the Review Crew Blog. ← The story of us. Part sixteen: now. I agree with you. Although we only have 4 children “time is money”. When I would watch shows where someone say saved $800…but put in 40 hrs a week cutting and searching for coupons I shuttered. It may be worth it for some (although when buying large quantities of toothpaste and sports drinks I don’t know how it is) but not for us.My husband happens to make a great living professionally. To make $800 would only take 8 hrs. Less than his 10 hr shift. So for us it makes no sense to dedicate that much time. Four times the amount of hrs.I do however get the coupons from the stores we use and they have been good about generating coupons mostly for the things we buy. Plus we get about 3 Free coupons for frozen fruit or chocolate chips thrown in also. We get the Target coupons and use them if needed.We only buy what is the best deal and things we use.This seems obvious, but I have seen people get caught up in “saving” when really if they bought the store brand it is cheaper and still a good product.So my big thing lately with anything I am trying to buy used or save money is to try to figure out if I am putting too many hours into searching the net when say DH could work a bit more or we just use the money saved.